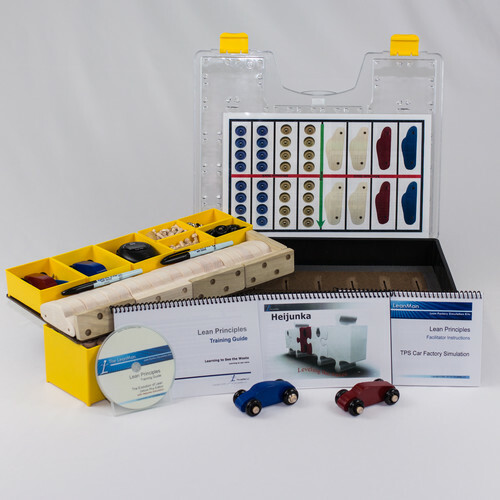 This presentation event is part of the Deluxe-Plus Heijunka Training Package, or it can be obtained as an optional purchase for use with the standard Deluxe and Deluxe Plus Car Factory Kits. The “Leveling the Waves” presentation presents an alternate way of approaching the function of master scheduling and planning for a lean manufacturing environment. Creating a smooth level work flow out of the chaotic and random customer demand is a challenge in a lean shop, and requires a managed disconnect from the MRP push. The Heijunka simulation exercise develops a unique approach to visualization of work flow, allowing the planning function to gain control over capacity issues and assure on-time delivery in a mixed-mode production work cell. The simulation exercise is designed to train the planning and scheduling members of the team, but is also an excellent tool to teach work cell operators lean flow methods. The team set up is variable but works best with 10 people. The facilitator guide includes a printed and bound color 48-page guide book and PowerPoint presentation which provides a complete discussion of the Heijunka control methods and includes animated visual simulations of the Heijunka flow in the PowerPoint slideshow. The Facilitator guide lists things to observe and point out to the people, comments to add for clarity, and suggestions for improvement. Requires one Deluxe Plus Heijunka Package, or the Heijunka Upgrade Package. Event time is approximately 2 hours for the slideshow presentation and simulation, but allow additional time to experiment with alternate flows. Room size should be a training room or large conference room with at least three tables and room for 12 people. 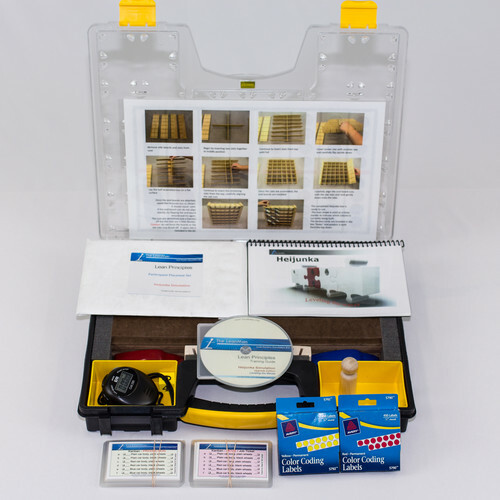 Materials include the color printed and bound Facilitator Guide, a 6x6 Heijunka Box, 16 Heijunka Kanban cards, 16 Job Ticket order cards, two 450 pc dispenser packs of detail components, and all supporting files on CD, plus all of the standard simulation materials included with the standard Deluxe Kit. 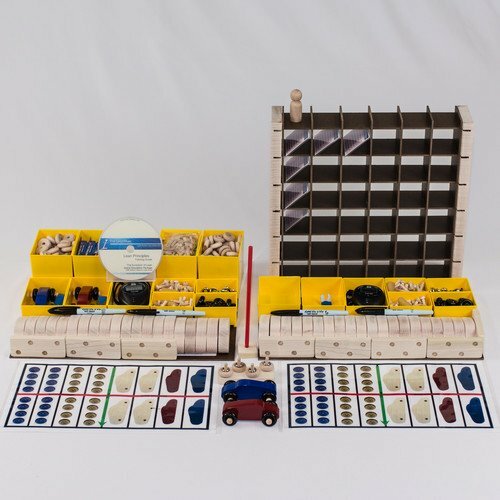 All materials are packaged in a single double deep container for easy transport and setup. Please Note: The Heijunka Simulation is included in the Grand Simulation Package.